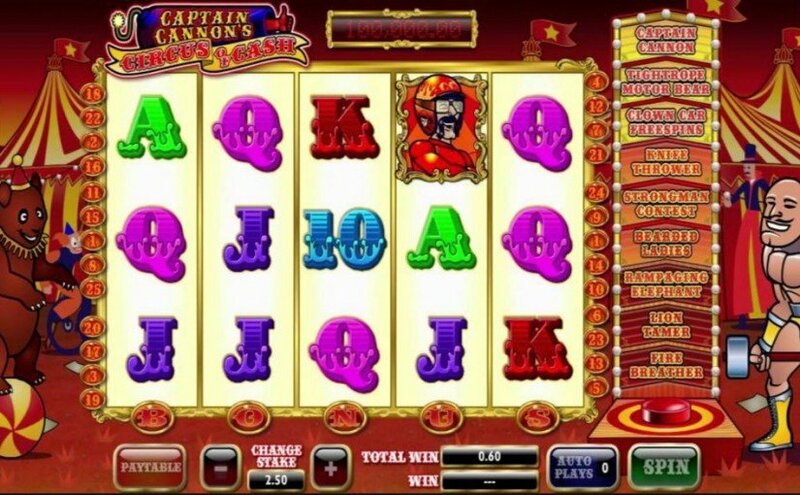 Captain Cannon’s Circus of Cash is a 5 reel, 25 payline online video slot powered by Ash Gaming. It has a circus theme and 9 incredible bonus features. Players must light all of the letters of “bonus” in order to be awarded one of nine special features. A strongman will appear and hammer the feature ladder button, the ladder will then light up from the lowest to highest and you will be awarded with the highest bonus reached. Potential bonus prizes correspond to the height if the feature on the ladder, the fire breather is the lowest and Captain Cannon is the highest. The progressive jackpot is won by seeing the golden clown in any of the top 3 features. The Fire Breather bonus will give you expanding wilds on the reels, The Rampaging Elephant bonus will knock symbols off the reels and replace them with new symbols. The Lion Tamer bonus will throw random wilds upon the reels. The Strongman Contest will allow players to pick a strongman for cash prizes. The Shave the Bearded Lady bonus will give players an instant win game where they could win between 8x and 50x multiplier. The Knife Thrower bonus gives players the chance to win between 5x and 100x in the pick and win bonus. The Clowncar bonus will give playetrs Free Spins. The Tightrope Motorbear Bonus will give players instant wins. And the Captain’s Cannon’s Wild Ride bonus will give players the possibility to win between 20x and 1,000x their bet and is the most generous bonus game that this slot has to offer.